I made a skin for MineCraft and when I went to use it the head was all white. Every time I try to make a skin this happens. 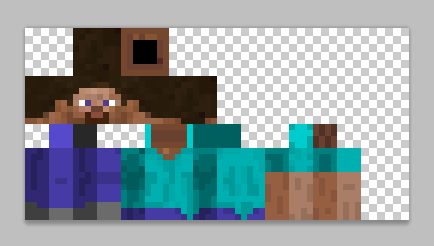 What do I do I've tried countless skin editors and always end up with a white head. First I made a skin, then I install it, next I start MineCraft, then I go in my inventory and bam! My head is white. I've used skin editing tools and installed the skin and every time the head is white. There are two likely possibilities here. 1. You didn't colour in the head in the head region. Minecraft skins have particular regions for particular parts of the skin. Wherever you're colouring, it's not where the head is supposed to be. I didn't make this reference image - only the smaller version. It's one of the most useful references I've found. 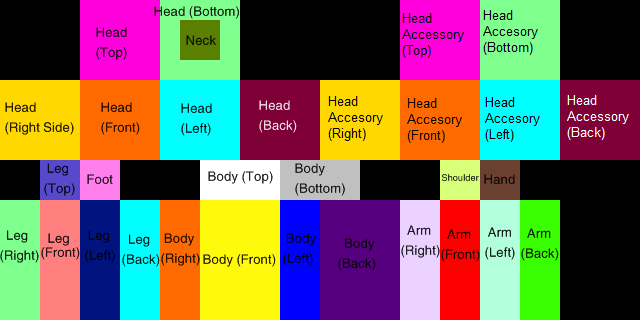 The limbs, body and head are fully coloured, as is required. The head accessory - which is a box that wraps around your character's head, allowing you to give it a helmet or crown (for instance) is transparent. It's very probable that whatever skin you're using, you've left the head accessory regions white. So now you have a white box wrapped around your character's head (not an invisible box) - so your character appears to have a white head. The simple answer is that you edited the skin in microsoft paint, which doesn't maintain the transparency of the skin, so the "helmet" area ends up white. Each of these can properly handle transparency in PNG images, and are legally free. Why does my character skin keep reverting to a naked girl? Why is Minecraft snapshot 13w39b launching when I'm expecting 1.6.4? Why won't Minecraft Magical Crops stay planted? Why are end cities not generated in survival, though in creative they are?